Carla Miller was interviewed by Gregg Fields for a Harvard University Safra Center for Ethics labcast recently. Can independent and local government ethics commissions reduce political corruption? Journalist Gregg Fields interviews Edmond J. Safra Center for Ethics Network Fellow Carla Miller about putting the heart back into government ethics training, and how a shift towards local government ethics initiatives may create an avenue for citizens to have an impact at the state level and beyond. 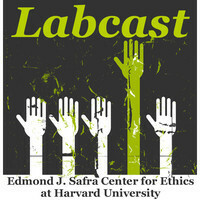 http://www.ethics.harvard.edu/lab/tools/378-podcasts -- this is the landing page for the Labcasts, so all of them are listed starting with the first at the top, and Carla's interview is currently a the bottom of the page [June 5th, 2014]. Or go to iTunes and search on the store for Itunes and search for "safra labcast" - it wil take you right to the Lab's iTunes page. Carla's interview was posted on June 5th, so it is showing up as podcast #9 on that page.